Known for their thunderous beats and infectious grooves, one of hard rock’s most renowned emerging bands, SILVERTUNG is giving fans a glimpse behind the rough and tumble exterior with a new acoustic live EP that is as personally riveting as it is raw and rollicking. Aptly named Lighten Up, the group’s first acoustic album will feature six of their most well known songs and is scheduled for an October 27th release. Lighten Up was recorded live in front of an audience comprising music critics and industry professionals at Wrightway Studios giving the album a truly authentic “jam session-like sound” as the band describes it. Produced and engineered by Steven Wright, each song on Lighten Up was completely reinvented. For example, “Face The Music” still has the same melody but is a very different acoustic with a more swing vibe to it… and “Devil’s Advocate", which appeared on Billboard Mainstream Rock Radio’s Most Added List the week of release, was originally heavy and aggressive and is now performed stripped down and accompanied by a violinist. 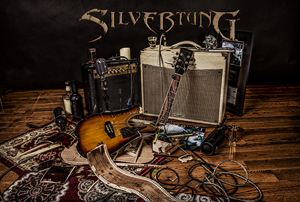 It’s this creative freedom and the ability to experiment with their music that led SILVERTUNG to explore the idea of an acoustic album in the first place. The first single, “Dig”, hits radio airwaves on October 9th. Lighten Up will be available for digital download wherever digital music is available, including iTunes, Amazon Music, Spotify, Gracenote, KKBox, Napster, Deezer, Tidal, Google Play, Pandora, etc. and on the band’s website HERE.